On Tuesday, September 22nd my son-in-law Frank dropped me off at the Horseshoe Bay Ferry Terminal where I bought my ticket to Hornby Island at the low price of $17.00. I was there in plenty of time, but apparently my brain hadn’t quite woken up yet. I heard the ticket agent tell me to take the stairs up and then follow the red line to Waiting Area A, but the red line part didn’t register. 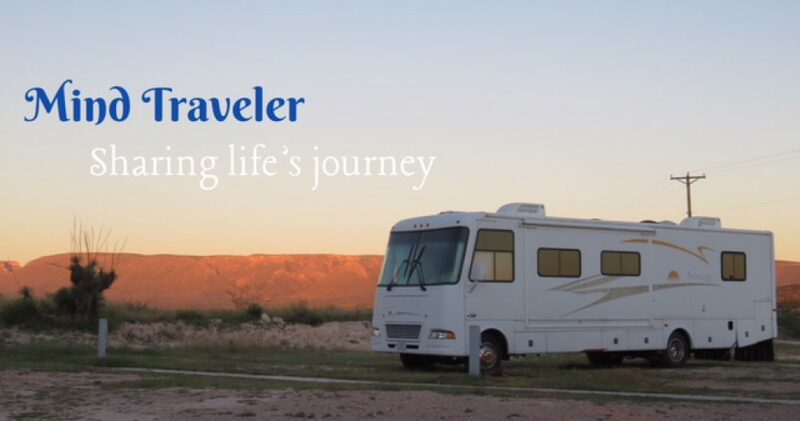 I looked for signs and when I saw a sign that read “Waiting Area A” with an arrow that appeared to be pointing to my right, I followed it through a door and across an outside passenger bridge. That didn’t seem right. I eventually got turned back around and this time followed the red line! The room slowly filled to capacity before we were called to board. Because the vehicle passengers hadn’t yet made it to the main deck, there were no lines at the cafeterias. I took advantage and bought myself a packaged sandwich and a coffee that would be my breakfast and lunch, supplemented with the cheese sticks and granola bars that I had in my bag. Those two items cost me almost as much as the ferry ticket, at $11.25! Be forewarned, if you plan to travel on the BC Ferry System, and you’re on a budget, pack some food if at all possible. The hour and a half trip went quite quickly. I slept for a while; I read my book, and I people watched, one of my favourite pastimes. I chatted with the woman sitting next to me who was travelling with her daughter and two granddaughters. She’d traveled by foot before and told me where to find the Island Link shuttle bus that I needed to catch when I got off the ship. I found it without any problem and an hour later I was at Buckley Bay on Vancouver Island, where my sister Pauline and her husband Jim were waiting to drive me, via two more much smaller ferries, to Hornby Island. I breathed a sigh of relief. I could relax for a week. Every time I visit Hornby I am charmed by the island’s uniqueness. This small island has lots to offer to anyone seeking a relaxed vacation away from the hustle and bustle of the city. It’s a place where there are no trains to catch, or crowds to push through. There are no big department stores or grand hotels and the only “traffic jam” you’ll encounter is while you’re waiting in line to catch the ferry when, reluctantly, you need to leave. Driving up from the ferry you will come to the hub of the island where all roads seem to meet. Here you will find a variety of little shops, including a bicycle rental shop, a couple of clothing stores displaying colourful summer wear and a few little eateries where you can experience some great and maybe unusual lunch items. The main destination in the hub is the Co-op, where you will find all the staples you need, such as groceries (many organic), pharmacy items, dishes, clothing and rubber boots. You will also find the post office nestled in one corner and an ATM somewhere in the middle. The only island gas station is outside the door. There are many residences on the island, but they are usually partially hidden from the road by the natural vegetation and are quite unobtrusive. The pace is slow and relaxed. The only “industries” are cottage industries – a variety of potters and weavers, and small farms. Clam Chowder by Chef Ben. Delicious with corn bread! We also enjoyed a fantastic music concert by renowned Marc Atkinson – acoustic lead guitar, Brett Martens – acoustic rhythm guitar and Scott White – stand up bass, at the Community Centre one evening, and a delicious meal at the Sea Breeze Lodge dining room another night. Before I knew it, it was time to pack for home. We were awake at dawn the next morning so thought we’d postpone breakfast and get back onto the Parkway before other traffic, hoping, again, to see some of the wildlife that a multitude of signs along the road warned us about. We saw none. Fifty-two kilometers later we finally came to the only service area on the Parkway so we stopped for breakfast. It was nearly 9:00, but neither the restaurant nor cafeteria were quite ready to open. We looked at the restaurant menu and decided that we’d just grab some coffee at the store and eat cereal in the motor home. The Continental Breakfast would cost us $14.95 each, and the full breakfast buffet of bacon, eggs, sausages and pancakes, would be $25.00 each! As it was, two coffee cost $7.50. 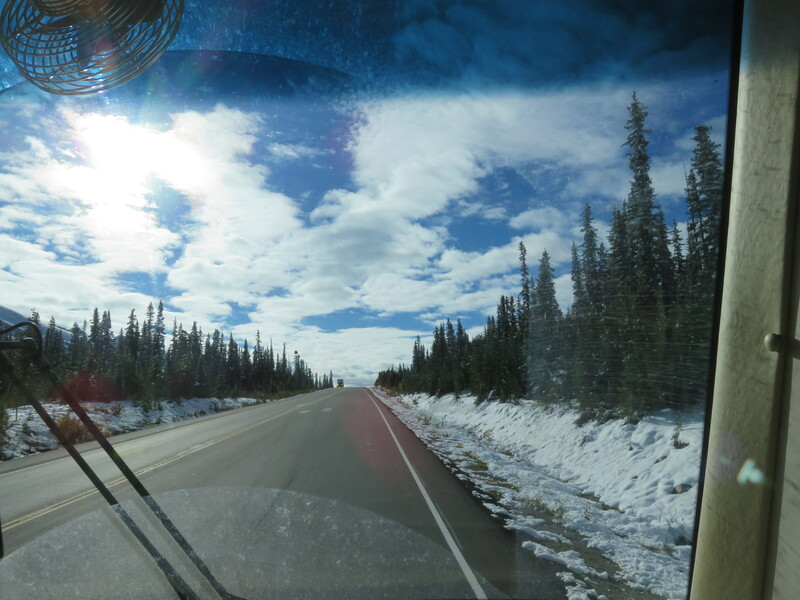 The higher we climbed over the mountain pass, the more snow we saw on the evergreen trees and in the ditches. Fortunately it wasn’t on the roads. That’s the kind of snow I like to see! It was beautiful. 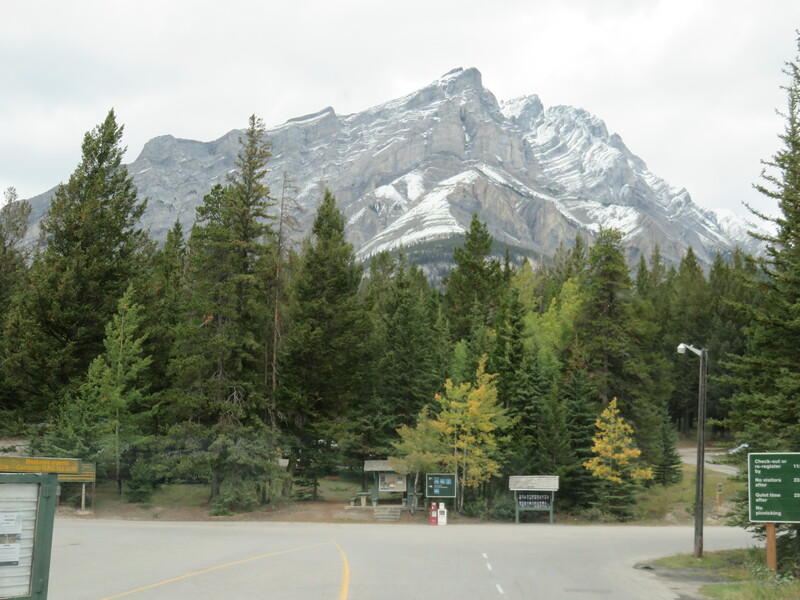 By 10:30 we had crossed into Banff National Park. 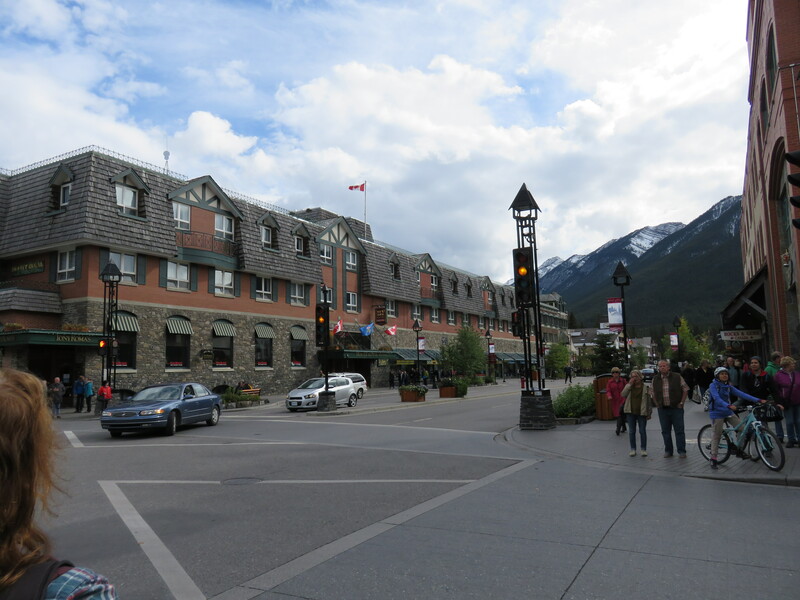 It was just before noon when we reached our next planned destination, Lake Louise, but because it was still early we agreed to continue on to Banff and stop at Lake Louise on the way back the next day. 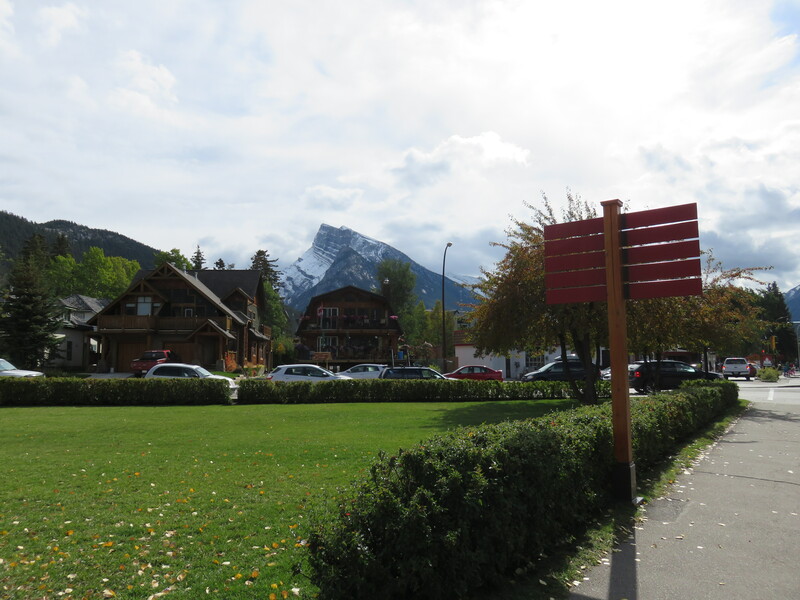 An hour later we were at the Information Centre in downtown Banff getting campground information and lunch locations suggestions. We walked to JK Bakery and Cafe to fill up on salad and homemade lasagna for much less than the breakfast offered along the way. I also picked up a big loaf of their fresh multi-grain bread for less than the price of it in a grocery store. 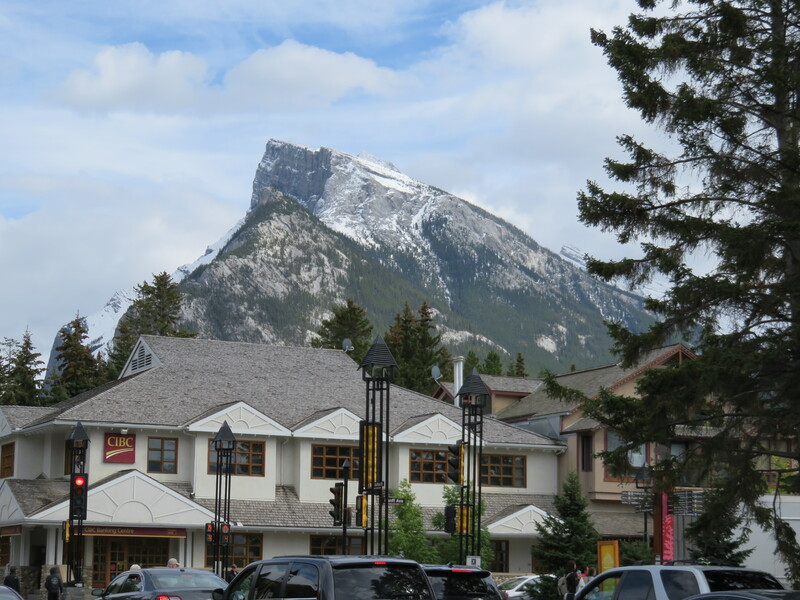 Look for it if you are ever in Banff. We found a lovely, full hook-up campsite at Tunnel Mountain Trailer Park, that included a bus stop to catch the bus back into town, which we did as soon as we were hooked up. After looking around the shops, we found a grocery store where we bought a few supplies, and then had dinner at Tony Roma’s. To our surprise, the same cheery young Australian woman who’d waited on us at JK Bakery was our hostess here. In fact, most of the servers in the restaurant spoke with Australian accents. They love Banff, and I can’t blame them. While we waited for our return bus I chatted with Wendy from London, England, who was in Banff on a bus tour. The next afternoon we were out of the National Parks and into British Columbia. 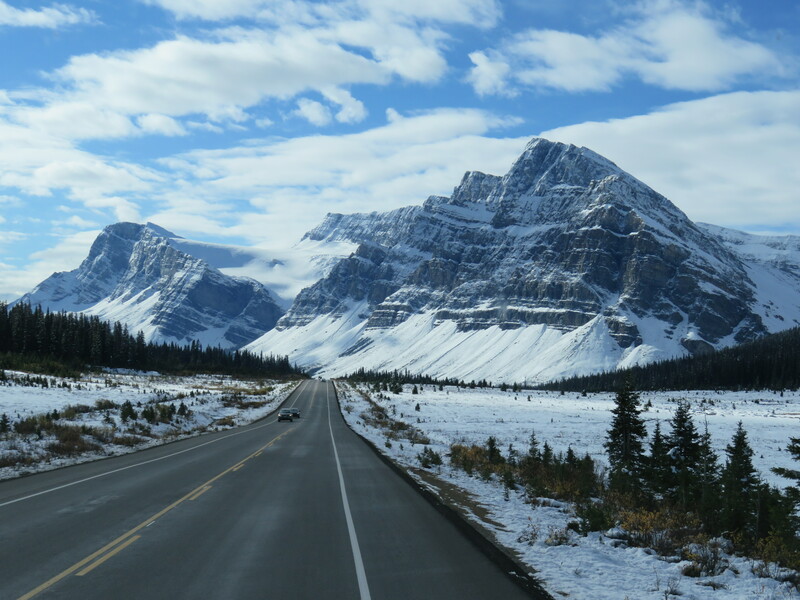 We decided to bypass Lake Louise this trip.